Do You Make a White One? “Hi, my…my…name is Bliss, but I am not feeling very blissful today. You see, I…I have cancer and I don’t have any hair. I was hoping you made a white chemo beanie? I didn’t see one on your website?” “No ma’am,” I said. “We don’t have any white ones yet, but we are thinking about making some possibly.” She stuttered, “Oh no! be..because…I’m getting married.” I nearly dropped the phone. It never dawned on me that a situation like this could occur. It only took me three seconds to answer. “Well, we don’t have white ones yet, but we can make you a custom Chemo Beanie wedding veil if you need one!” “Oh goodness!” she exclaimed. “That’s so wonderful, problem is, I need it in like two weeks.” I have stage IV cancer, and my long-term boyfriend wants to marry me.” I had to catch myself thinking, “Did I just say that I could do that?” But she started weeping, “This is a…amazing?” Our manufacturer doesn’t sew individual beanies, so it was all on me. I didn’t even know how to sew really, but I wasn’t worried about that. I was determined to bring Bliss back to Bliss, because I could hear the terror in her voice and then the sudden joy. I scoured the local fabric stores, ripped apart one of our beanies, got some donated lace from an old wedding dress store, and got to work. 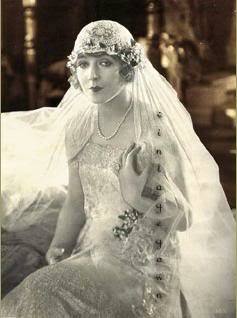 I googled 1920’s wedding veils because visions of the Gatsby style were coming to mind. Then I met a women named Martha from from a local sew shop, who happened to have a picture of her grandmother wearing a similar style, and the two of us stayed up most of the night to get this thing together, and overnighted our creation to a speechless bride. Working together to accomplish that goal was a great joy, and we knew after that first one, that would eventually be others, since 2010, we have donated a dozen creations for women with this unique need.